On Friday, Atlanta Ozone shocked everyone by knocking off number one overall seed Seattle Riot. On Saturday, they were effortlessly brushed aside by San Francisco Fury in a 15-5 thrashing. Atlanta enjoyed and then suffered a tale of two games. But what was the difference from one game to the next? Why was Ozone able to knock off Riot and then offer virtually no challenge at all to Fury? Primarily, San Francisco did a significantly better job at taking away from Atlanta what they wanted to do offensively. Against Riot, Ozone sought to put their handlers in dangerous throwing positions and then attack deep. But Fury came in with a plan to take that away from them. Fury also made a concerted effort to challenge Atlanta in the deep space, something Riot failed to do. Fury was much more effective at taking Ozone out of their game than Riot was did the day before, and that was perhaps the starkest difference between the two games. As a result, Ozone was never able to find any sort of rhythm and it resulted in far more drops and missed 50-50 plays, plays that Ozone came down with against Riot. Fury also was much more efficient on offense than Riot, punishing Ozone with a ruthlessness no other team in the division has displayed this weekend. 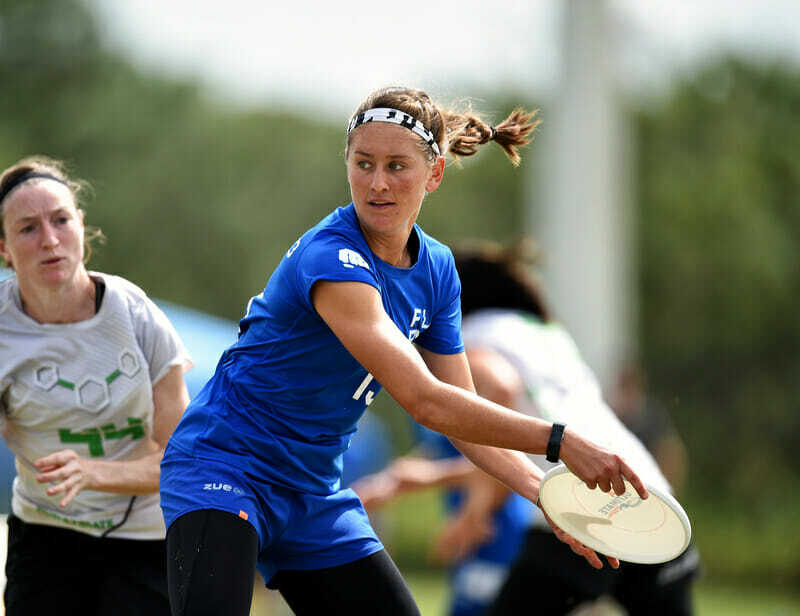 Fury’s biggest advantage has been their backfield, with players like Carolyn Finney and Anna Nazarov crushing teams with their throws and backfield movement. But no Fury player has been as impressive as Alex Snyder. The veteran has been absolutely impervious to the Sarasota wind, effortlessly putting throws anywhere on the field. Against Riot on Friday, Atlanta was tremendous. They played a fantastic game and were deserved winners over one of the most dominant programs in the division. It was always highly unlikely that they would be able to replicate that against Fury. Still, Ozone broke down the impenetrable ‘Big Four’ power structure that has defined the last three seasons. They just happened to run into an absolute buzz saw in a Fury team playing the most complete ultimate in the division. Ozone came into the semifinals off their biggest win in recent memory and playing the best ultimate they could realistically play, but Fury is simply playing at such a high level right now that it didn’t even come close to mattering. Comments on "Fury Emphatically Ends Ozone’s Run"